Jim, a Fine Gael figure formerly of the Dept. of Justice, is discussing politics with the barman. The thrust and parry of their conversation is momentarily interrupted by the arrival of a group of tourists from the Ghost Bus which tours haunted Dublin. The men at the bar give the ghost-bussers a sceptical glance before returning to the more pressing matters of the day. The bright summer evening with its still-roasting sun make a hard sell out of what should be the perfect location for ghost stories. Ciaran, the seventh generation of Kavanaghs, has little time to talk of ghosts as he is busy rustling up delicious, good value tapas, in the modern side of John Kavanagh’s bar, known to all as The Gravediggers. The pub got its nickname because it’s built into the wall of Glasnevin Cemetery and gravediggers used to come in for a few scoops after a hard night’s digging; Dublin.ie is told the occasional gravedigger still frequents the bar. Situated in picturesque Prospect Square at the original entrance to the graveyard, the Gravediggers looks pretty much the same as when the first Kavanagh opened it in 1833. It has that warm, conversation-enhancing feel that solid wood, brass and centuries of nicotine bring to the table. The fact that modernity appears to have been left outside the door accounts for the fact that The Gravediggers is a much sought-after location for movies and commercials. Ciaran readily admits that the movie side of things helps: not alone do you get paid, but it enhances the reputation of the bar. The fact that it is situated slightly off the beaten track also boosts that “hidden treasure” feel. I certainly recall the first time I went there some 25 years ago. It was one of those misty autumnal evenings when the scent of decaying leaves merges with firework sulphur. You turn off the busy main road and find yourself in that charming, quiet square. And there on the opposite side, by the cemetery gate, lit-up and beckoning, was the Gravediggers. “This is pure James Joyce,” I thought. And that’s not just Irish sentimentality. The Lonely Planet Guidebook recently featured the Gravediggers in their 50 hidden treasures of Europe. “And that’s been quite a boost for business,” Ciaran says. People come alright. “Why? This is a proper old Irish pub where conversation is primary” Ciaran says. “No television, no radio, no singing,” he says. The policy is strictly enforced, even when it hurts. And in one infamous case, when Ciaran was a young teenager washing glasses, it really did hurt. “Yeah. The infamous Luke Kelly funeral. I was an impressionable young lad and they all came in, Ronnie Drew, U2, the rest of The Dubliners, The Chieftains, everybody who was anybody!” Ciaran says with a wistful look. “They had a few drinks. Then out came the instruments and they started to tune up. It would have been something special,” he says. “My Da went over and said ‘Sorry boys, no singing. If I let you sing, then the locals there without a note in their head will want to sing. And I have kids upstairs’” Ciaran says. So they packed up the instruments and they left. “It would have been the best session ever, and especially in the pub that didn’t have any music, it would have gone down in legend. 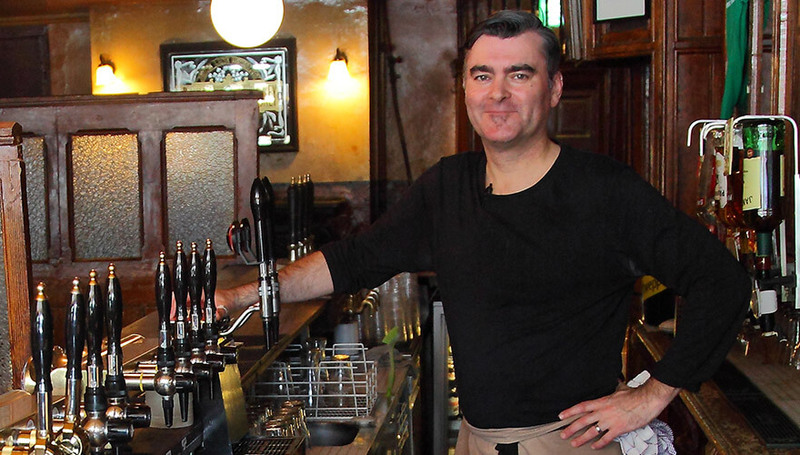 But that was the rule – it’s a place to just drink, it’s always been about the drinking,” Ciaran says. “You can’t have one rule for the locals and one for the rock ‘n’ rollers. But as a young lad it hurt to see the world of rock ‘n’ roll get up and walk out of my life,” he added. Ciaran compensated for his loss by taking off on his travels a few years later and didn’t return home for 15 years. He worked as a chef for Club Med in a host of exotic places. “Yeah that was a little rock ‘n’ roll,” he says with a glint in his eye. He worked in Switzerland and then he worked for the BBC in their canteen. When Ciaran returned to Ireland about 12 years ago, he opened up the food side of the business. “Good quality food at decent prices,” he says. “People come in and have some food and then they buy a drink. Pubs are about selling drink,” he says. Given the fact The Gravediggers has been going successfully since 1833 and there’s no visible sign of business slacking off, the Kavanagh family must have found a viable working model. Be sure to pay them a visit. And remember, you’ll find it a lot more fun if you go before the hearse takes you there.